Manchester City striker Gabriel Jesus has got the Citizens off to a flying start this evening, the Brazilian scored a lovely diving header after a wonderful cross from Kevin de Bruyne. 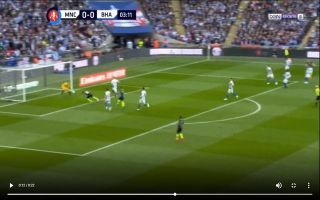 In the fourth minute of the clash, playmaker Kevin de Bruyne picked up the ball on the right-wing and fired in a lovely low cross into the box, the ball evaded Brighton’s defenders and Jesus dived down to head the ball into the back of the net at the far post. Manchester City will have their eyes set on lifting the FA Cup this season, with the proposition of meeting either Watford or Wolves in the final – Pep Guardiola’s side will definitely be expected to come away with the cup.